(Nanowerk News) Is matter falling into the massive black hole at the center of the Milky Way or being ejected from it? No one knows for sure, but a UC Santa Barbara astrophysicist is searching for an answer. Carl Gwinn, a professor in UCSB’s Department of Physics, and colleagues have analyzed images collected by the Russian spacecraft RadioAstron. Their findings appear in the current issue of The Astrophysical Journal Letters ("Discovery of Substructure in the Scatter-Broadened Image of Sgr A*"). RadioAstron was launched into orbit from Baikonur, Kazakhstan, in July 2011 with several missions, one of which was to investigate the scattering of pulsars — the cores of dead stars — by interstellar gas. 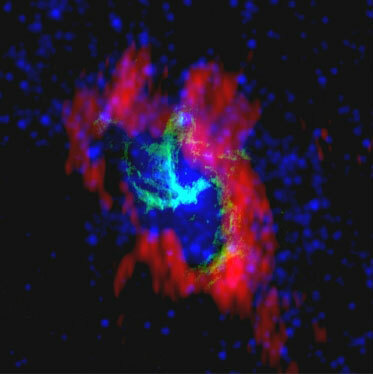 What the team found led them to examine additional observations of Sagittarius A-Star (A*), the source that marks the Milky Way’s central black hole. Sagittarius A* is visible at radio, infrared and X-ray wavelengths. This massive black hole — which contains 4 million solar masses — does not emit radiation but is visible from the gas around it. The gas is being acted upon by the black hole’s very strong gravitational field. The wavelengths that make Sagittarius A* visible are scattered by interstellar gas along the line of sight in the same way that light is scattered by fog on Earth. In order to better understand the substructure, Michael Johnson, Gwinn’s former graduate student now at the Harvard-Smithsonian Center for Astrophysics, conducted theoretical research. He realized that the anomalies could be used to infer the actual size of the underlying source. Additional observations made using the Very Long Baseline Array — an interferometer consisting of 10 identical antennas distributed across the United States — and the 100-meter Green Bank Telescope in West Virginia showed the presence of lumps in the image of Sagittarius A*. Recent upgrades have greatly increased the sensitivity of these telescopes. Even so, evidence of the lumps, or substructure, remained extremely faint. A friendly international race is going on to see who will be the first to image the black hole’s emissions and thereby determine whether gas falls into the black hole or is being ejected in the form of a jet.